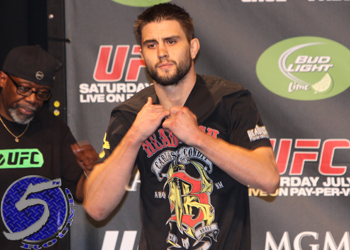 Because Nick Diaz can’t answer the bell for an immediate rematch with interim welterweight champ Carlos Condit (Pictured) courtesy of a flunked UFC 143 drug test, Condit has decided he’ll ride the pine until 170-pound king Georges St-Pierre returns from injury. Condit captured the manufactured crown 10 days ago by taking a highly controversial unanimous decision victory over Diaz. Although “The Natural Born Killer” left Las Vegas with the hardware and didn’t have to grant Diaz another tango, he was willing to while allowing GSP’s surgically-repaired right knee to mend. However, before the papers for ‘Diaz vs. Condit II’ were ever drawn up, the Nevada State Athletic Commission reported Diaz had tested positive for marijuana for the second time in five years. With Diaz now facing a year-long suspension, Condit has concluded the only scrap that makes sense is a blockbuster title unification bout against St-Pierre. GSP claims he won’t be able to start training at full capacity until July. He’s hoping to resume his illustrious career in November. The baddest welterweight in bare feet hasn’t been seen since collecting his ninth consecutive victory at UFC 129 in April 2011.